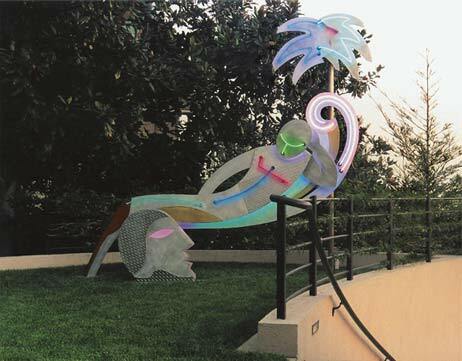 Lakich was commissioned to create a neon sculpture for a multi-million dollar home in the hills above Santa Ana. The site was a grassy area outside the indoor swimming pool. The artist presented four different concepts for the project, but it was this one that intrigued Mrs. Freed as her husband is a therapist. make sure that the scale was right. She then built it out of honeycomb aluminum supported by a steel structure. Tell Me About Yourself intrigues many people as it is unusual to see a neon sculpture in an outdoor residential setting. But it has proved popular with the couple’s guests, and it delights them that when coming home from an airplane trip they can spot it from the sky on the ground below. Aluminum, brass, copper; neon and argon in glass tubing.